Overview: “Ghost” is a concept which explores the possibilities available when yachts design starts to adopt the technology and approach which is already evident in architecture and transportation vehicles such as planes and trains. Since time immemorial, yachts have been built as modular ships, with a very simple orthogonal grid of frames, bulkheads and columns – not exactly the technology of the future, where carbon composites, spaceframe structures and advanced glass technology can play essential roles in the overall structure and cladding of a contemporary yacht. 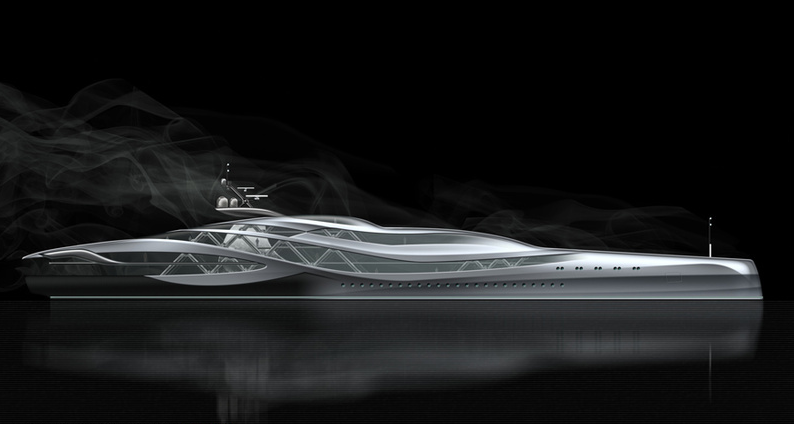 On “Ghost”, the essential elements of the yacht, structure and envelope or skin, are handled quite separately for optimum efficiency as part of a minimalist approach and to achieve the free-form surfaces which suit the function and style whilst retaining the structure in its purest sense, creating a fully visible articulation of the space frame structure. This approach has already been adopted on many of the latest skyscrapers and buildings such as airport terminals, museums, etc., which require large unobstructed spans and where it is fundamental to define the most streamlined and efficient structure, and separately determine the required cladding, transparency and look and feel of the building. This is a particularly obvious approach for large yachts, subjected to massive loads and pressures, yet built without consideration of the potential of using the latest materials on a tremendously light, strong and rigid structure with a highly versatile skin, designed to keep the water out, the guests protected and achieve amazing panoramic views out. This approach is totally functional and yet another creation from a team that enjoys lateral thinking and an “out of the box” approach to design. The Ghost concept is one of total flexibility, where a tremendously rigid spaceframe system takes care of the torsional rigidity, and allows large span openings, such as particularly handsome shell doors capable of accommodating a 15m limousine tender, which on most yachts could only run-alongside or deck stowed. Conversely, the skin of the yacht is designed for maximum efficiency underwater, and thanks to the developed transparency, allows the creation of open spaces with excellent outward views, yet fully shelter from the elements. 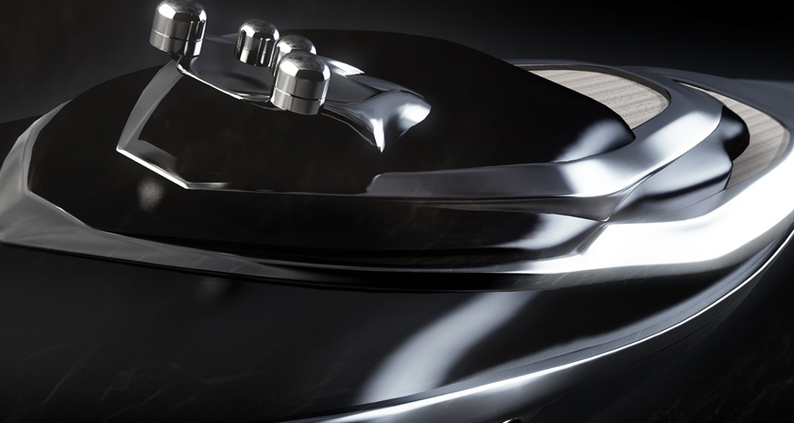 A further “first” in yachting is the honest expression of the complex systems as an integral part of the design. Such visibility will not only add to the interest and the feeling of being part of a complex machine, but of course, will also help efficient maintenance and control. Ghost also boasts a number of unique features, such as underwater viewing, sliding helipad platforms, opening skylights, a telescopic signal mast forward, a glass sided pool within a handsome gymnasium, a massive atrium around one of the main structures, with balconies and flying bridges linking the various spaces. Green credentials are particularly strong, with the adoption of a new light sensitive film imbedded on the skin of the yacht, generating electricity to take care of all the hotel loads. The design has not only been developed to achieve efficient hydrodynamic characteristics, but also aerodynamic – that should not only boost efficiency, but also provide a quieter environment underway.